Not all green pea soup has to be pureed. For those of you who prefer the taste of whole cooked peas verses pureed, this is the tasty meal you’re looking for. 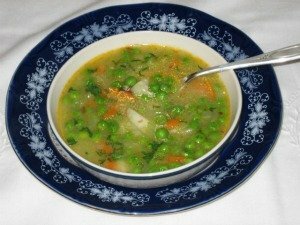 Let’s face it, not everyone likes the texture of pureed soup, some of us like to enjoy those cute little peas just as they are. Peas are a vegetable that freeze extremely well giving us the opportunity to enjoy them year round. This is handy in the winter months when fresh peas are unavailable. Whether they are fresh or frozen they make an awesome green pea soup. Many people describe eating whole cooked peas as little morsels that burst between their teeth, saying they are a little crispy on the outside (if not overcooked), yet the inside has a semi-sweet smooth filling. Yes, they are definitely unique in taste and texture. These little green morsels are one of the most nutritious leguminous vegetables that provide phytonutrients, minerals, vitamins and anti-oxidants all extremely beneficial for health. If you do not have any chicken broth handy or in the freezer just substitute it for water and add 2 chicken bouillon cubes for flavor. 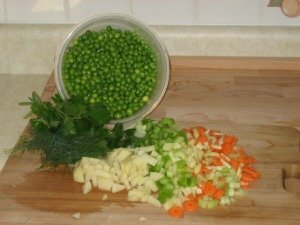 If you prefer to use fresh green peas then add them in at the same time as the carrots, celery and potatoes so they all cook evenly. In a soup pot, add the oil, butter and onions. Turn stove on medium high and sauté onions until translucent. Add celery, potatoes, carrots and spices and sauté another 5 minutes. Add flour and mix well with vegetables and add all liquid. Bring ingredients to a boil then reduce heat and simmer for 10 minutes. Add frozen peas and simmer an additional 5 minutes or until veggies are tender. Remove from heat and add the parsley and salt and pepper to taste.